Every conscientious entrepreneur knows that creating a product roadmap is a must for any results-oriented business. It becomes a strategic document that helps them to draw up an action plan and to monitor its implementation. But when it comes to real actions, most newcomers find this process provoking more questions than answers. It’s no wonder, since strategic business planning is quite an extensive concept in general. Well, today Roadmap Planner team would like to clear things up and to answer all your whats and whys. What is a Product Roadmap? What are its main goals? Which components must your roadmap include? And what are the main roadmap templates? Check it out! In a nutshell, it is a visual step-by-step guide for how you’d like to implement your product strategy. It represents the vision and direction that you’d like to follow over time. Internal teams and external stakeholders should be represented in a product roadmap, too. It shows where your product is going and how you intend to get there. The main mistake that managers make while creating a product roadmap is drawing it up as a static document. Your roadmap shouldn’t be a plan just for show, which you’ll throw away after the start of a new product development. It ought to become an integral part of your everyday work. A well-articulated product roadmap will help you to manage your work processes, examine your strategic objectives, and establish clear frameworks for sustainable development. If your roadmap is static, you won’t be able to add any new information or adapt it to internal and external changes. A static document impedes your product development and makes your roadmap outdated over time. That’s why it is essential to use best strategic planning tools such as Roadmap Planner. 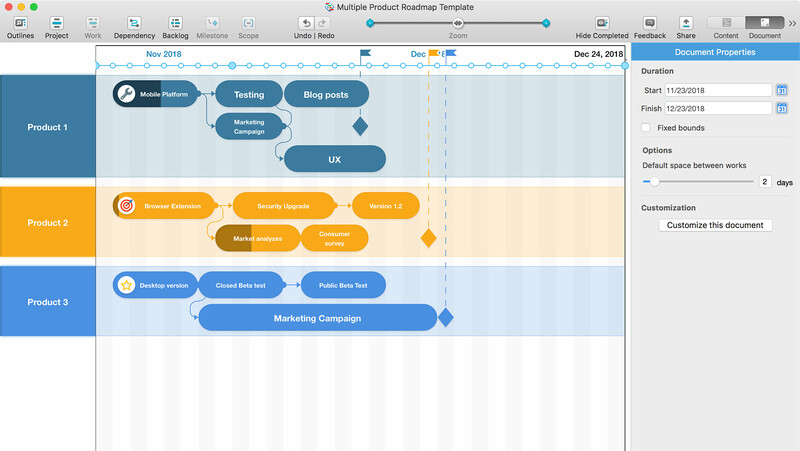 It will help you instantly create your roadmap, visualize your product strategy, and edit your document – even on the go! What are the main goals of Product Roadmap? Which key elements should be included in your Product Roadmap? Product Strategy. This is the groundwork of your roadmap. If you are interested in what product strategy is in detail, it is a clear vision and plan for the entire product lifecycle. It typically includes detailed information about your target audience, business objectives, unique selling proposition, and market analysis. This vision will lead your brand to your desired achievements and be the main guideline that keeps you on track. Products. Even though it’s quite obvious, we would still like to mention it. Your product could be anything: an idea, a service, a piece of software or hardware. If you have more than one product, or your products can affect each other, don’t forget to add all of them to the roadmap. Releases. Since the launch of new versions of your product creates value for your customers, a release schedule is an extremely important part of your roadmap. It can be implemented in the form of milestones. The dates of finishing your product and its official release can vary in your plan. This distinction becomes necessary when you schedule an official release for clients on a particular date, but stakeholders also would like to see how certain updates work to adjust the product strategy in advance. Goals. These have to be clear, measurable, achievable, and time limited. This is necessary in order to track key metrics that show how you are making your vision and strategy a reality. This is a perfect choice for managers responsible for a single product. This template can be based on your team initiatives and should become your key development tool. With this template you will always be informed which processes and tasks should be done on a day-to-day basis. In the aforementioned example, we have divided the tasks among development, Q&A, and marketing teams. If a PM is responsible for more than one product, they should choose this template. It covers several products and allows to create long-term vision of a particular product’s future in the context of the other ones in development. 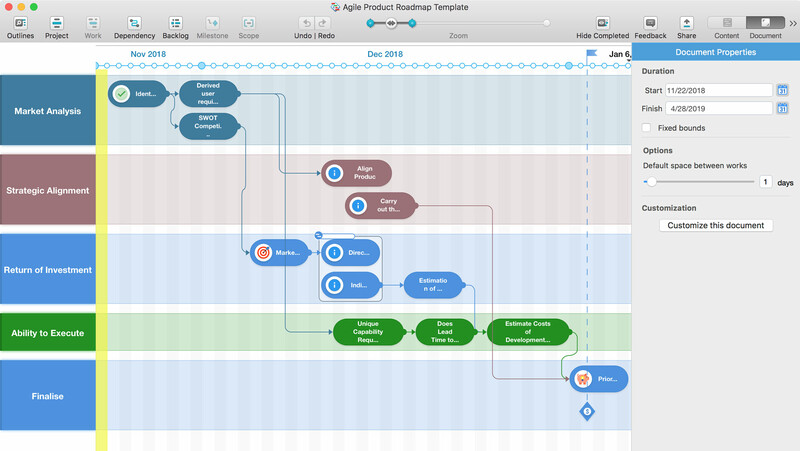 You can also create Single-product roadmaps for each project and then connect them into a Multiple one. Agile roadmap is a dynamic one. It is more detailed and is used to concentrate on shorter-term end goals. Agile doesn’t link your strategy to specific dates, focusing on specific tasks and their progress instead. This roadmap is perfect for release planning. 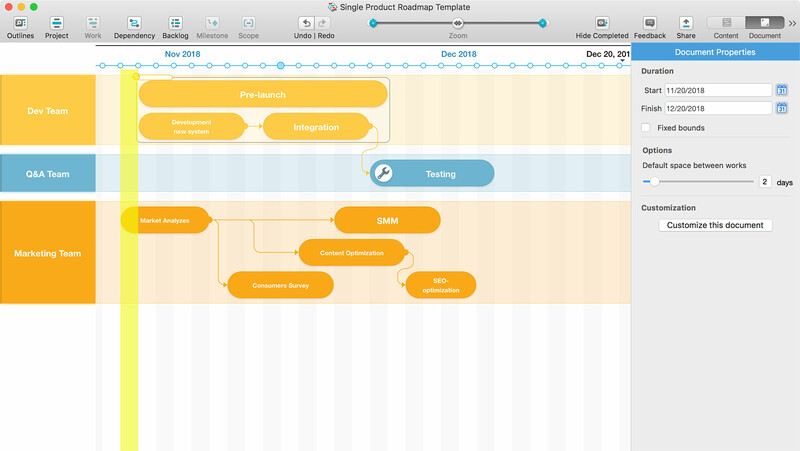 You can find an example of it in the Templates tab of our Roadmap Planner app.